Joy got behind the wheel of a Tesla all-electric sportscar yesterday and went zero to 60 miles an hour in a few seconds. It felt like a rocket to the moon. Initially, she was too timid to test drive this super car, but on consulting with Bob, decided it would be chicken not to. Sitting in the driver’s seat felt like the Grand Prix. This is about as low-slung and sporty as it gets. Because traffic was heavy near the Tesla dealership, Joy asked the salesman to do the initial driving. After careening around the show room like a stunt car driver, he raced onto the highway like a shot. It felt like going straight up. On a quieter road, Joy took the wheel and spun around the bay. A few surprises: When you take your foot off the accelerator, the car automatically slows down. You rarely use the brake. This takes getting used to, but it feels extremely safe. When Joy test drove a BMW convertible, the car essentially drove her. With the Tesla, she felt confident quickly. When you begin, a video screen shows you the world behind you, and you can plug in an iPod or iPhone for music through the car’s speakers. You push the “D” button to drive. The electric car starts up soundlessly though sound has been added for safety reasons. Some people stepped in front of them without realizing a car was coming. The engine noise is the same as is heard in the latest Batman movie, “Dark Knight,” when Batman revs the batmobile. We had to ask the price. ($109,000 after tax rebates.) The Tesla salesman claimed the car was basically free because you don’t pay for gas, there’s almost no maintenance, and it keeps its value. A couple he knew who bought a Tesla six months ago got nearly their original price, give or take a thousand or two. 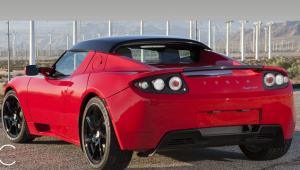 The Tesla needs little maintenance because it lacks a transmission, muffler, and other parts that typically require repairs. Unlike the Prius or the Chevy Volt, it’s not a hybrid, but 100 percent electric. We’d consider getting one but we only have 34,000 miles on our 10 year-old Honda minivan.